Sam is a talented sprinter, who tasted huge success in his first year under the guidance of Jim Bradley where he won the rich 70m Don Furness Memorial. After another two years with limited success he decided to make a change. At the completion of Season 2006/2007 he contacted Nick Fiedler asking if he would be interested in training him. A training structure was co-ordinated to overcome the geographic difficulties, with training being primarily in the Eastern suburbs yet Sam lived in Williamstown on the other side of town. The training program was designed and structured to ensure all components of the training program could still be achieved despite the geographic difficulties. 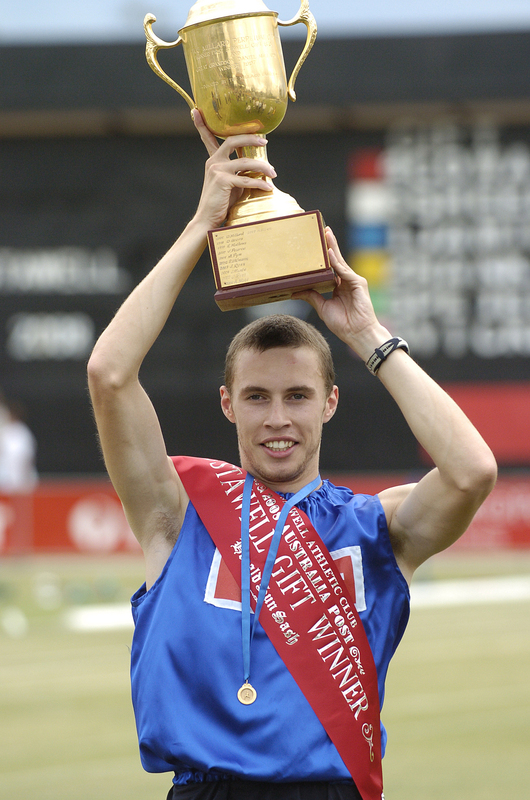 Sam had significant strength gains through the pre-season and this allowed much more time during the season to focus on speed development and technical changes which culminated in him improving dramatically, particularly in the month and half leading into Stawell where he then went on to win the Stawell Gift. After winning the Stawell Gift, he began to capture other interests and although he maintained some training for the following season, followed by a small amount of underdone competition, he decided that he did not want to compete if he wasn't totally committed to his training. He wanted to pursue other interests which were not condusive to a completely committed training program. This was a big decision for him to undertake knowing that he was clocked over 100m at 10.1 HH and 10.2 HH in the weeks leading into his Stawell win. He was fully aware of his potential but also understood the committment to fully realise it and maintain it. He knew his commitment was not strong enough to pursue that, and he had to balance the limited reward that running provides compared to all the effort. This was the factor in his decision despite being encouraged by Nick to be coached elsewhere, or any other alterantive arrangement to ensure he remained in athletics. However, he was happy with his coaching and environment, but he could not fuly commit to training, no matter what the environment or coaching structure was and he decided to retire from athletics. He currently plays social basketball. Whilst he still remains young we hope he changes his mind and finds the inner motivation and time to again compete and again realise his potential despite already climbing the pinnacle of pro running. He maintains a strong friendship with Nick and the team and still attends team social events and the odd training session to feed his spasmodic fitness desires. Sam contacted Nick in April 2010 to return to training with a view to competing again. 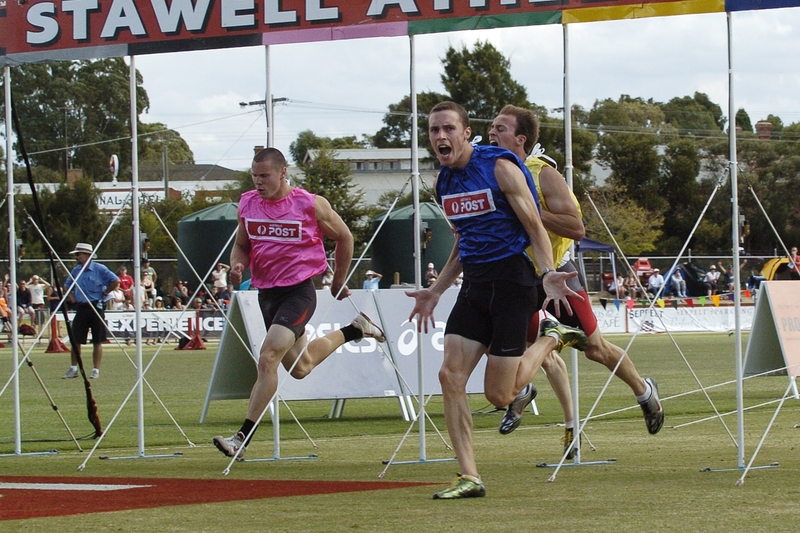 Sam winning the 2007/2008 Stawell Gift. Front view of the finish. Sam is a member of the Williamstown Athletic Club. Pro Debut : Season 2004/2005 Nortchote 70m Open. 3rd Ballarat 120m Gift, 3rd Stawell 120m Gift. 1st Northcote 70m Open, 1st St.Bernards Don Furness 70m Open. Sally joined the team in season 03/04 but did not compete until 04/05. She made her pro debut at Northcote in the Novice 70m. She didn't enjoy much success in her formative years for various reasons. It was difficult for her to train with the squad because she lived in Williamstown and the team generally train at Ringwood. She had extensive school and work commitments which also hampered her training. In 2007/2008 she committed more strongly to training and had improved results across the board, running her best over all distances up to and including 400m and also performing PB"s in the long jump and 400m Hurdles. She also had the honour of making pro finals at major events in Victoria, ACT, SA and NSW in the same season. She lost focus since season 2007/2008 but remained with the squad for many of the following seasons however without really training. She then training under the guidance of her father on a limited commitment level. During Season 14/15 Sally rejoined the squad and commenced training with a view to getting fit again after giving birth to her first child. She is a member of the Williamstown Athletic Club. Sally at 2007/2008 Bendigo Womens 400m presentation. Pro Debut : Season 04/05 Nortchote Novice 70m. 1st Noble Park 100m Novice, 1st Bendigo Womens 400m. 2nd Ringwood 70m Novice, 2nd Ballarat Womens 120m, 2nd Stawell Womens 120m. Darren joined the team in season 2005/2006 and made his pro debut in the 550m at Dandenong. Darren has a fantastic work ethic and strives for more and more work at training. He regularly needs to be told to ease back on rep work so he can complete the sets. He has come from a triathlon and football backgound and has improved dramatically since joining the team. He has lost 10kgs since joining. 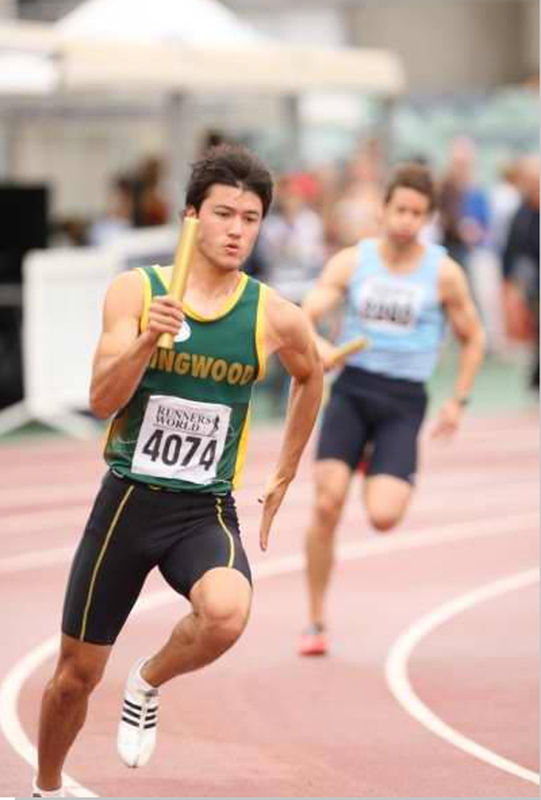 He is a member of the Ringwood Athletic Club. Pro Debut : Season 05/06 Dandenong 550m. 3rd : VRTA 400m Novice, 3rd Casey 1600m Novice. 1st Peninsula 400m Novice, 1st Wangaratta 800m,1st Stawell 550m, 1st Stawell 400m Frontmarkers. Winner of Bruce Walker Trophy for best performances over 400m, 550m and 800m at Stawell. Winner of VRTA Middle Distance Athlete of the Year. Scott joined the team in October 2006 whilst only 16 years old, and he has improved dramatically since that time. His first introduction to pro running was at VRTA Epping where he watched and then he ran in the U/21 race which he won. He did the same at Northcote where he again won the U/21 race. At Maryborough in lined up in his first official pro race being the Novice 70m which he went on to win. He then lined up in the 120m Gift where he was lucky to get through the semi finals to make the final via fastest times. In the final he ran his best race to that point in his life and won convincingly from 7m to become the youngest ever winner of the Maryborough Gift. Scott had many personal problems and this required much life changing moments. He therefore lost the desire to train and compete with far more pressing needs to be focussed upon. He is retired from all forms of athletics until he gets other life issues in place. After about 12 months off Scott has resumed running close to where he is living in Box Hill and is now a member of Box Hill Athletic Club. 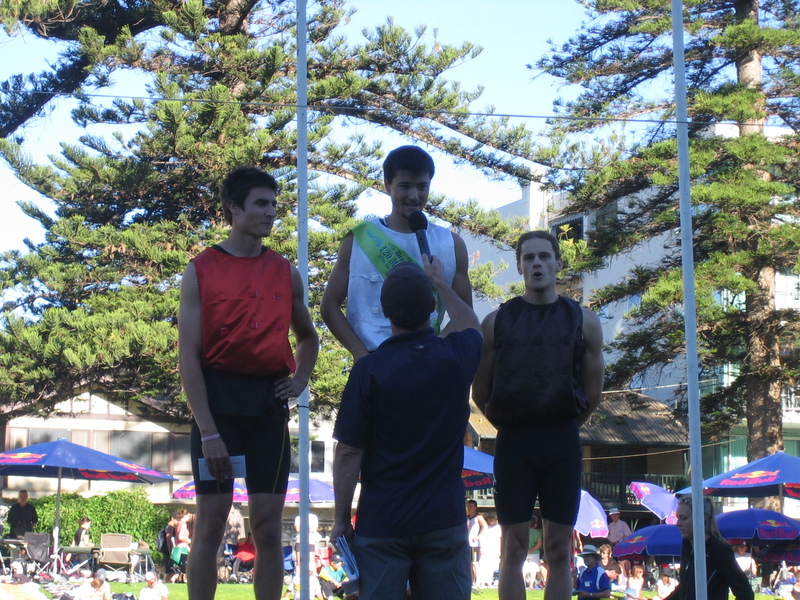 Scott at presentation of the 2006/2007 Maryborough Gift. 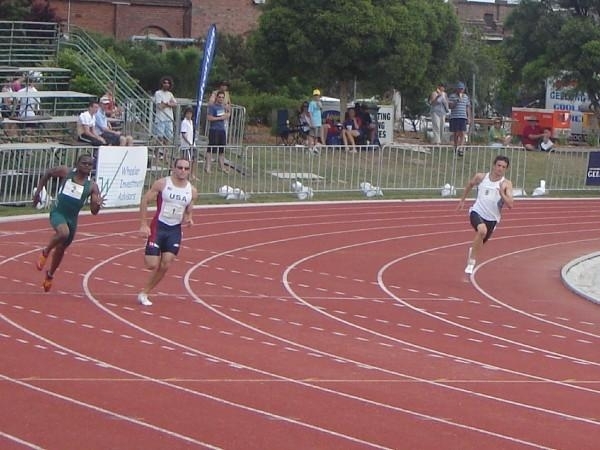 Scott on the inside racing John Woods (USA) and Anthony Alozie (Nigeria) at 2007/2008 Geelong National Series 200m. 3rd Ballarat 120m Novice or U21. Stawell 120m Gift Semi Finalist. 1st Maryborough 70m Novice, Maryborough 120m Gift, 1st VRTA U/21 Sprint, 1st Northcote U/21 Sprint. 3rd Ringwood 70m, Keilor 70m Invitation Skins, 3rd Geelong U/21 Sprint. Josh was a newcomer to athletics when he joined the team as a 16 year old and had never competed in athletics before, with the exception of school events. He has now improved dramatically and has recorded good results over distances including 70m, 100m and 120m in the pros, and 100m and 200m in amateur competition. His pro debut was this season 05/06 at VRTA Epping in the 70m. Later that day he competed in the U/21 sprint where he finished 3rd. He has had extensive exposure to amateur racing to develop his confidence and place him in different race environments to handle pressure during different stages of the given event. He continues to show maturity with his great willingness to learn. Josh made his first final at Maryborough in the 70m Novice finishing 6th. He also made the semi finals of the 70m Open that day. He has had numerous successes since then and has devloped into a very good sprinter despite constant interuptions with a back problem. 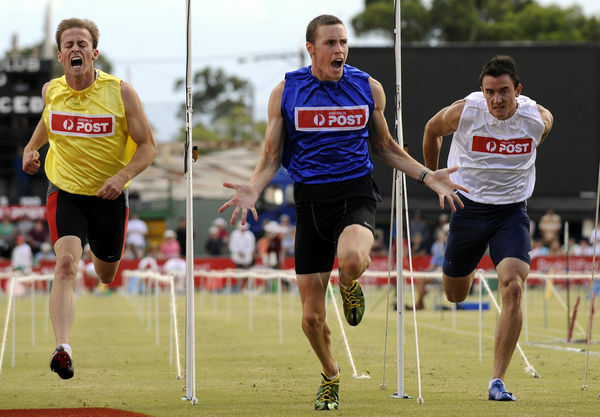 He finished 4th in the Stawell GIft final of 2010, and later that season finished 3rd in the richest ever Ballarat Gift. Josh at the 2007/2008 Bay Sheffield 120m Restricted presentation. 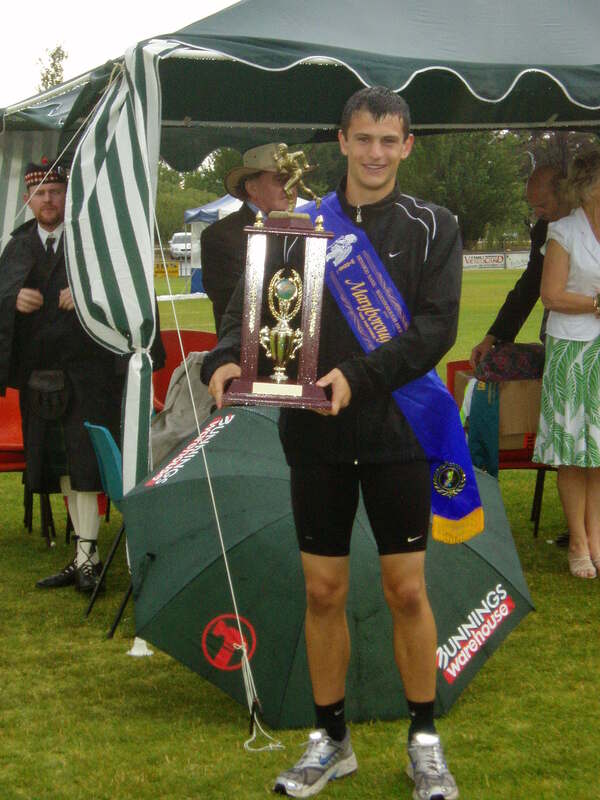 Josh at 2007/2008 Wangaratta 70m presentation. Pro Debut : Season 05/06 VRTA 70m Open. 1st Wangaratta 120m Novice, 1st Stawell U/17 100m. 3rd Keilor U/21 120m, 3rd VRTA U/21 Sprint. 1st Keilor U/21 120m, 1st Burramine U/21 Sprint. 2nd Burramine 120m Backmarkers Invitation. 1st Bay Sheffield U/20 120m. 2nd Quenabeyan 70m, 2nd 120m Ballarat Novice or U/21. Shane has had an extensive career in both amateur and pro ranks. 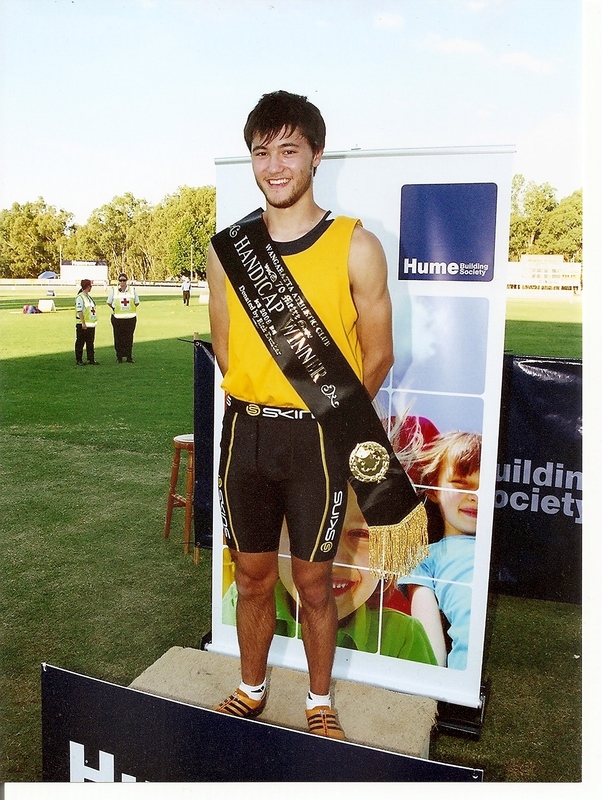 Shane dominated South Australian 100m running for an extensive period and also was highly successful in the pro ranks. He had a close affiliation with the Flinders Club in SA. Some of his success includes winning the Bendigo Gift and Mt.Gambier Gift, and also making 4 Bay Sheffield Gift Finals (2 x Runner Up to Capobianco and Brimacombe respectively). 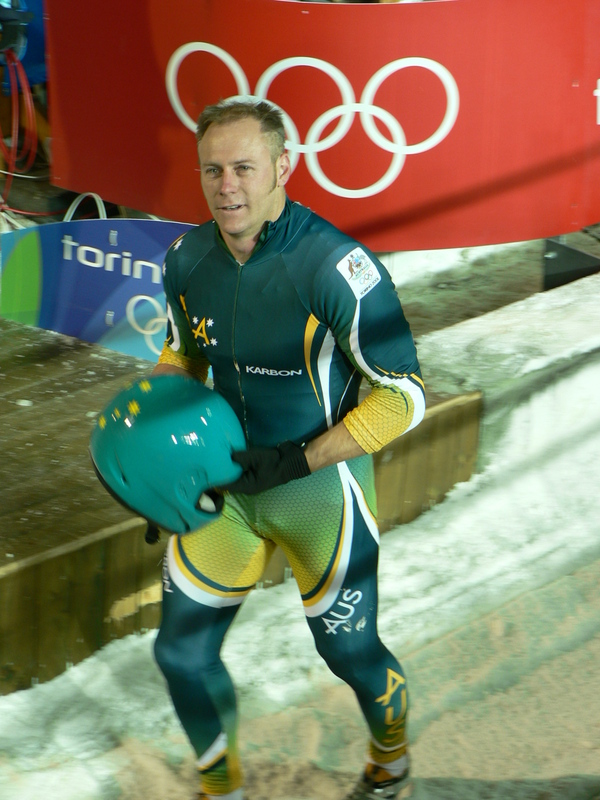 Shane had a complete year off athletics four years ago where he concentrated on bobsleigh where he represented Australia in numerous events in both 4 man and 2 man competition. in 2009 he has commenced another campaign to be part of the next WInter Olympics where he hopes to be part of the 4 man bobsleigh team. Shane joined the team in the pre season of 04/05. He missed the beginning of the season due to bobsleigh committments overseas but did manage to get a few amateur races in before he left including numerous runs over 100m into a headbreeze where he clocked 10.7HH. After returning from overseas he returned to make the Bay Sheffield Gift Final. He continued his good form running 2nd in the Rye 70m. He backed that form up winning the Ringwood 70m Open the next week. He then went on to be runner up in the Wangaratta Gift and had a purple patch at Keilor where he won the 70m and was runner up in the Gift to Ezenwa in a tight dip on the line. Shane finsished competition at Stawell 2010 after 20 years of competition and now intends to pursue coaching. He competed in the Winter Olympics as the brakeman in the bobsleigh in 2006. In 2007 he played Rugby League for the Waverley Panthers in the VRL and has scored six tries from nine games including a 95m try. In his first game he suffered severe concussion and in his last game he dislocated a finger. At the commencement of the 2008/2009 track pre season he stopped his rugby training to allow his ageing body more recuperative time for athletics training. At the 2007/2008 Bay Sheffield he was inducted into the Bay Sheffield Hall of Fame. After not running for about 8 years and focussing mainly on coaching Shane approached Nick in Season 17/18 to again start training for Season 18/19. He has resumed competition in Season 18/19 and he has been enjoying the competition. 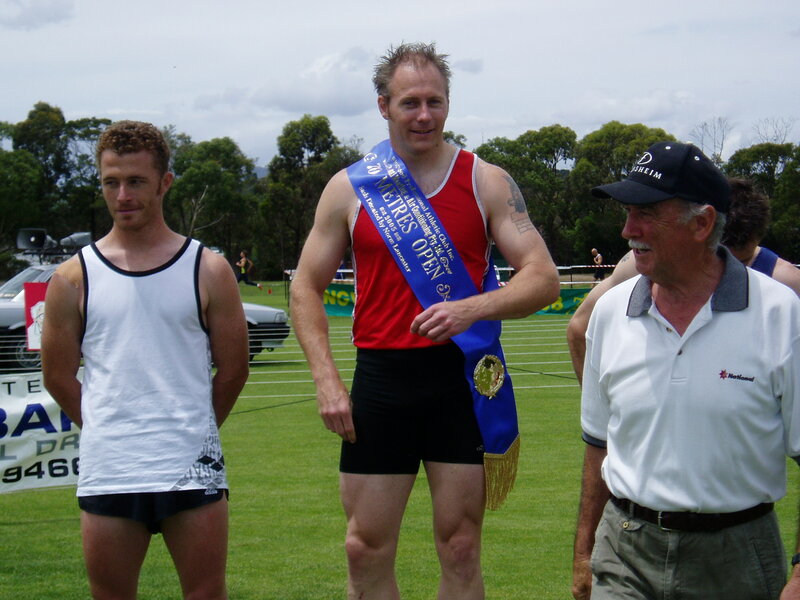 Shane at presentation of 2004/2005 Ringwood 70m. 1st Henley & Grange Junior Boys 120m, 1st Payneham Novice 120m, 1st Reynella Junior Boys 70m, 1st Plympton Junior Boys 120m, 1st Bay Sheffield Junior Boys 120m, 1st Henley & Grange 120m Gift. 1st Henley & Grange Junior Boys 70m, 1st Henley & Grange 70m, 1st Colley Reserve 120m Gift, 1st Reynella 120m Gift, 1st Plympton 120m Gift, 1st Whyalla 70m, 1st Whyalla 120m Gift, 1st Henley & Grange 70m. 2nd Bay Sheffield 120m Gift. 1st Gaza 70m, 1st Colley Reserve 70m, 1st Colley Reserve 120m Gift, 1st Plympton 120m Gift. 1st Bay Sheffield 120m Backmarkers Invite. 1st Colley Reserve 120m Gift, 1st Plympton 120m Gift. 1st Mt.Gambier 120m Gift, 1st Bay Sheffield 120m Backmarkers Invite, 1st Camden 50m skins, 1st Bendigo 120m Gift. 1st Flinders 70m, 1st Adelaide Oval 70m, 1st Adelaide Oval 120m Gift. 1st Ringwood 70m, 1st Camden 50m skins, 1st Keilor 70m. 2nd Keilor 120m Gift, 2nd Loxton 120m Gift. 3rd Wangaratta 120m Gift, 3rd Rye 70m. 3rd Bay Sheffield 120m Backmarkers Invite.